Jake Ball has taken over as the new host of The Talk Of Trent Bridge Podcast for 2019, replacing Luke Fletcher. Fletcher manned the show for the first 11 episode since its inception in April 2018, covering many and carried issues including the ball-tampering scandal, the FIFA World Cup and what makes Trent Bridge special. Now he leaves the chair open for Ball to make his mark on the show, and the Welbeck Wizard has taken little time in showing his excitement. “This is quite possibly the biggest takeover since Zoe Ball replaced Chris Evans on the BBC Radio 2 Breakfast show,” he said. 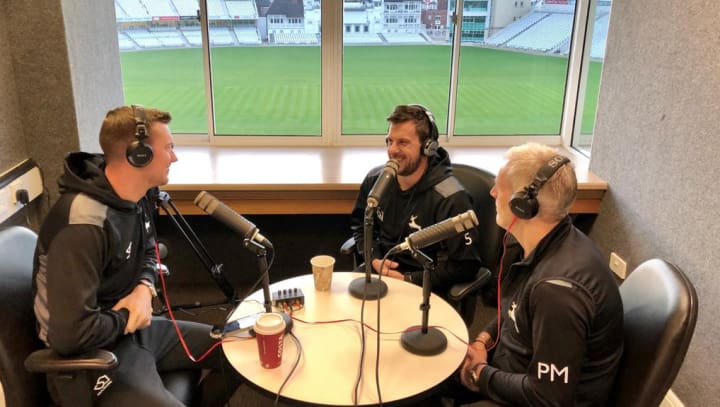 He was joined by what he described as the ‘top brass’ of guests for his debut podcast, Nottinghamshire Head Coach Peter Moores and captain Steven Mullaney. The duo joined the 27-year-old to discuss the hard work going on behind the scenes in winter training, Outlaws around the world and what advice they would give to up and coming cricketers. Ball also talked about a number of his teammates, both with Nottinghamshire and within the England setup, providing behind the scenes insight into sharing a dressing room with Alastair Cook, Stuart Broad and James Anderson. Meanwhile, he delves deeply into the dynamic between Peter and Tom Moores and how the duo interacted during Nottinghamshire’s reigning player of the year’s childhood years. In order to never miss an episode, subscribe to the Talk Of Trent Bridge podcast through iTunes or Spotify by clicking on the 'subscribe' button on the audio above.